I'm back, did you miss me? I admit I've fallen behind on reviews because, well, life. Oh, and I launched a new business in January that has, gratefully, kept me busy. I'm slowly figuring out how to balance it all. It may seem crazy to some, but I love the different aspects of my life so it's all worth it. I've talked about the lack of diversity within our genre before, not pointing out something shocking or new. And it's not just racial diversity, but religious diversity too. We live in a world where our differences are so quickly pointed out to be used negatively that it would be really lovely to escape into a world where our differences can be highlighted and celebrated. I do believe our entertainment should comment on current social affairs, but also show and teach how we can do things better. 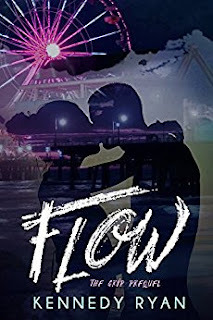 I was super excited to learn of Kennedy Ryan's newest release, GRIP, and its prequel, FLOW, as I had been in conversation with other regarding the story and they sounded like the books I've been seeking. A love story that shows that we can love one another despite our differences and learn from each other. To show that in the face of adversity, love will always win. While I got a beautifully written story with an incredibly smart, strong, sensitive black (gasp!) hero and an amazing original poem, the story of Grip and Bristol fell short for me. Is this a case of expectation not meshing with reality, yes. I had prepared myself for an emotionally gripping, no pun intended, story of two people fighting to keep their love alive when society, even in 2017, still looks at interracial couples as being different. What I got was 70 percent of a story of two people in love, but not together, for reasons that had nothing to do with race and all to do with Bristol's fear of repeating familial mistakes. Unfortunately by time we reach what I thought was the real plot of the story, there's only 30 percent of the book remaining. I felt it was a bit forced and, honestly, after everything else, I kind of didn't care about the issues. They weren't the driving force behind the story. There was also a cliched villain and red ribbon wrap up. Racial hatred is not something new to the genre. There are many movies, television shows and yes, books that have tackled the subject. I appreciate any attempt at making our society a more inclusive one, but sometimes the attempts fall flat. As with ANY book, read and make your own decision. I welcome different perspectives in the comments.